Project Manager is responsible for the project. She manages internal communication inside the Centre as well as the communtication with financial support provider (TA CR) and public. Project Secretary is responsible for daily management of the project. He manages administrative issues and provides the support for project manager, committees and participants. Steering Committee is responsible for decision making during execution of project activities. The committee is concerned with conceptual and strategic issues and it is also authorized to solve potential disagreements between project participants. Industrial Committee is an advisory body of Steering Committee. The Committee guarantees practical applicability of project results for both project participants and civil engineering branch as a whole. Scientific Committee is an advisory body of Steering Committee. Its main tasks are to supervise research and technical activities, to secure high quality of project results and to oversee the keeping of time schedule of project activities. Work Packages are subsets of thematically tied working activites aimed at solution of research tasks. The packages are interconnected to maximize the exploitation of research outputs. 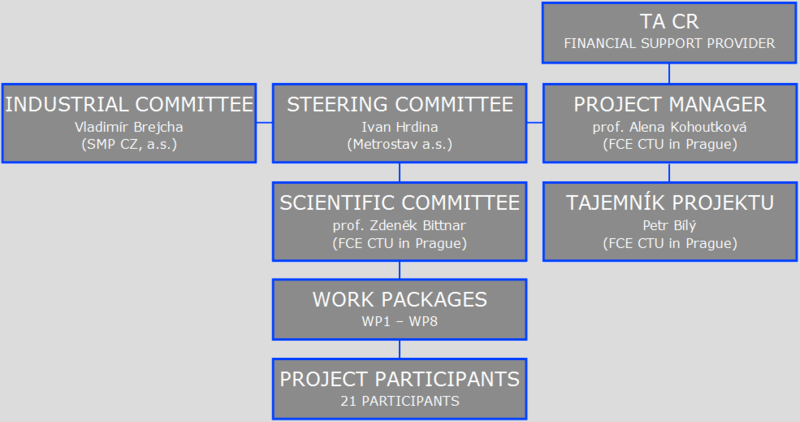 Project Participans cooperate on research activities in work packages and contribute to project budget. They depute the representatives to project committees.